The ability of vinyl fencing to hold up against wind depends on the quality of the fencing and the installation method. Manufactured originally in the 1970s from plasticized polyvinyl chloride, the early vinyl fences were either picket or privacy-fence styles constructed in the same way as wooden fences, with the pickets attached to the cross rails with glue or screws. Modern extruded vinyl fencing is melted into a semi-liquid state and then pressed through an opening, which gives it the desired shape. Vinyl fencing comes in similar styles to wooden fencing but is more durable. Vinyl fencing comes in a variety of styles, including the original solid-panel privacy and picket fences, as well as three-rail, post and rail, lattice top and vinyl-covered chain link. The vinyl used may be mono-extruded, which incorporates a UV protector in the materials, or co-extruded. The co-extruded vinyl has the UV protector contained in the outer layer of material, which is bonded to the inner layer. Mono-extruded vinyl is considered to have better UV protection and is, therefore, more expensive. The ability of vinyl fencing to withstand wind depends on the design as well as the strength of the posts and the materials. A chain-link or picket-fence style offers less wind resistance, because the wind is able to pass through the gaps, while the privacy fence provides protection from strong winds. The average vinyl privacy fence is designed to withstand normal wind. Provided the fence is correctly installed and supported, it should hold up against winds of up to 100 mph. To withstand high winds, install vinyl picket fencing using fence posts of between 3 ½ and 5 inches square, with wall thicknesses of .160. Privacy fences, however, require posts of 5 inches square with heavy-duty wall thickness of between .130 and .270 inches, depending on the height of the fence and the strength of the wind in its location. Embed the posts in concrete footings of 18 to 24 inches deep, and add a post cap for better support. In high-wind locations, using aluminum stiffeners for horizontal rails, posts, gates and hinges provides extra stability. 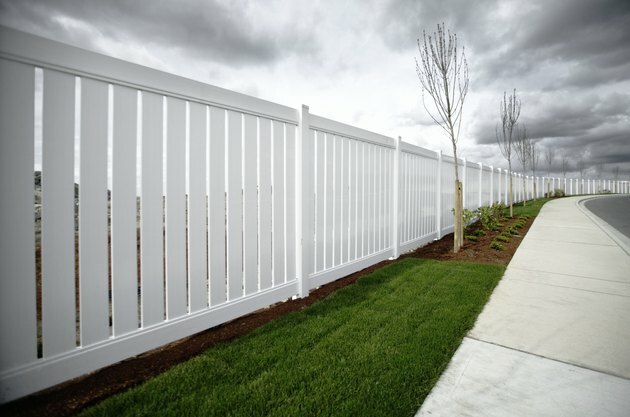 Vinyl fencing offers a number of additional benefits, besides its ability to withstand wind. The fences are free of potential nails and other sharp objects; they're not difficult to clean, are less likely to fade in color and don't succumb to damp or mold as easily as wood. Vinyl fencing is comparable to wood in price and almost maintenance-free.